Eric Sharp let us pop by the Mu Performing Arts rehearsal room to talk about ‘Holy Crap, Here I Am’ from his new play Middle Brother. 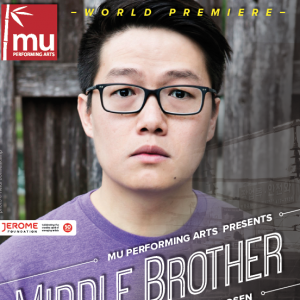 Middle Brother is a fictionalized physical theatre telling of his personal Korean adoptee experience. He talks about visiting Korea as an adult and the unique noraebang sound he and Michael Croswell brought to the song. Middle Brother premieres at The Southern Theater on September 12th. More info at muperformingarts.org.